Who is the US Fighting in Iraq? Who exactly is the US fighting in Iraq? Graphed by self-confessed identity of captives, it is largely Sunni Arab Iraqis, often motivated primarily by the opportunity to earn some money from the resistance leaders. Source: New York Times, 2007/08/25. 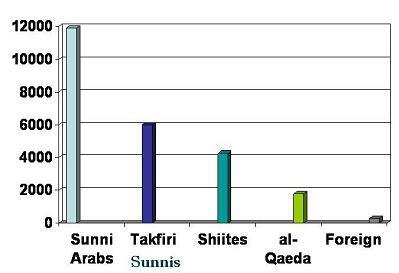 The second largest group is Salafi Takfiris, i.e. fundamentalists who do not consider Shiites to be Muslims and who believe they may be harmed with impunity. The third group is Shiite militiamen (how many of these are non-ideological paid employees is not specified). Self-identified al-Qaeda are only 1800 of the 24000 in captivity, about 7 percent. (Of course, most of these fighters are not really al-Qaeda in the sense of pledging fealty to Usama Bin Laden or being part of his organization; they are using “al-Qaeda” to mean “bogeyman”: i.e., ‘be afraid of me’.) Foreign fighters at 280 are about 1.1 percent. While it could be argued that it would take bold captives to declare themselves al-Qaeda, there would be no downside to telling the Americans one was a takfiri. There is no reason to think the over 11,000 unspecified Sunni Arabs is fundamentalists. Opinion polling still shows a majority of Sunnis favoring the separation of religion and state. The odd tendency of the US military and press to refer to all guerrillas in Iraq as “al-Qaeda” is obviously not justified by their own subsequent interrogations of captured suspects. Readers should write and complain when they see al-Qaeda used indiscriminately to describe Sunni Arab fighters. And when you hear Cheney say we have to fight al-Qaeda in Iraq, you will know that most of the people the US is fighting there are no such thing.